While the much-anticipated return of David Lynch’s ground-breaking, bizarre Twin Peaks is never far from our coffee-addled minds, it’s been looming even larger since the entire cast was revealed. What better time to binge-watch the original 30 episodes—and ponder what we’d like to see when episode 31 finally arrives next year? The plot of the new Twin Peaks has been cloaked in secrecy. The updated cast list gives us just about the only hints we’ve had about what might happen. 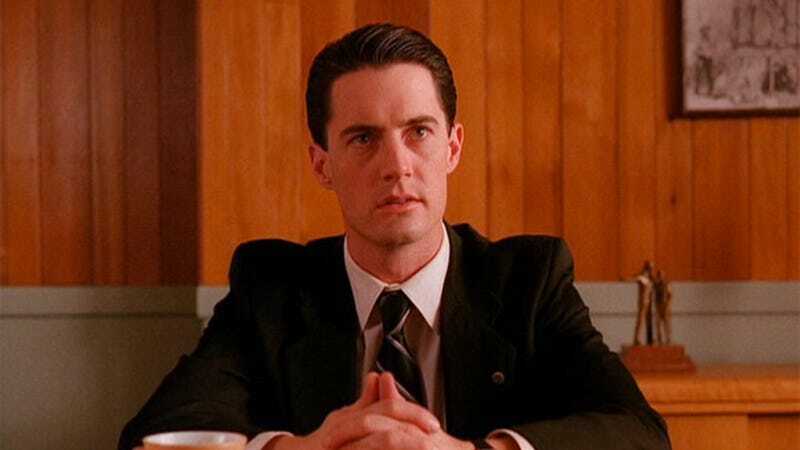 We do know that the story will pick up 25 years after the original series ended, that it was filmed in many of the same locations, and that—unlike back in the day—every episode will be written by Lynch and co-creator Mark Frost, and directed by Lynch. With all that in mind, here’s what we’re hoping for. With Lynch still pulling all the levers, we’re looking forward to more raucous Scandinavians, endless rows of donuts, and spontaneous nose-grabs breaking up a show that will surely contain plenty of nightmarish horrors, too. Twin Peaks just wouldn’t be the same without this delightful mix. That’s good, because a fair bit of housekeeping will be absolutely necessary. Most pressingly: Did Cooper stay evil and become a Bob-possessed serial killer? (Doubtful—who wants to watch Kyle MacLachlan murder anybody?) Is Cooper still in the FBI? If not, what’s he been doing all these years? What brings him back to Twin Peaks—or did he ever leave? Did poor beauty queen Annie ever make her own way out of the Black Lodge? We’re dying to know. We’ve been wondering since 1991, to be honest. But to really succeed in its return, Twin Peaks needs something new—an overarching element that propels everything forward, much like the Laura Palmer case did during its first seasons. (Another mysterious murder would make sense, but Lynch will probably not make that most obvious choice, bless him.) Fan service is important—and we’re expecting to see a lot of it—but ideally the show will also stand alone on its own merits, and find fresh intrigue to drive its narrative. As the opening credits reminded viewers every week, the isolated town of Twin Peaks has a population of 51,201—small enough so that most everyone knows each other, but there are still some strangers lurking about. Back then, pay phones were still in use, convenient whenever someone wanted to make an anonymous call, which was often. With no internet, prurient hookups were arranged through the classified ads in Flesh World magazine. And though it was the 1990s, a distinctly 1950s sensibility permeated everything, particularly in the music, cars, and clothes; Audrey Horne’s vintage-vixen wardrobe is, even today, the stuff of fashion dreams. Twin Peaks will obviously need to keep up with the times. It’s been over 25 years, and the culture has changed. Presumably there will be cell phones, and any police files will be stored on computers, not in cabinets. But since it’s an otherworldly place that kind of exists suspended in its own time zone—blame the forest, or specifically, those damn owls—it should never feel too much like the real world. It’s a given that Lynch won’t veer too far into the current age for that reason. But it would be sweet if the show retained the retro quality that so distinguished it in the 1990s. The fact that crooner Julee Cruise is back on the cast list is a very promising sign. Speaking of that cast list, we’ve now had some time to give it more scrutiny, and we have some thoughts on what the show should plan for the returnees. Specifically, the ones we’re most excited to spend time with again. There are a few returning actors whose characters kicked the bucket on-screen. The most prominent one: the awesome Sheryl Lee. Bringing Lee back had to happen—she played Laura Palmer, Laura’s lookalike cousin Maddie, and Laura’s terrifying Black Lodge double. Aside from MacLachlan, Lee is the most important actor on the show; she was also the center of Twin Peaks: Fire Walk With Me, its feature-film prequel. Will she be playing yet another version of Laura—maybe a now middle-aged relative who visits Twin Peaks, the place where tragedy touched so many members of her family? Or is she just being credited because she’ll appear in a flashback, or because someone will hold up that now-iconic Homecoming Queen photo? Other dead returnees include Ray Wise, who played Laura’s father, Leland—the unfortunate vessel for her killer, the angry spirit BOB—and Walter Olkewicz, who played sleazy drug dealer Jacques Renault. Leland smothered Jacques in his hospital bed, ostensibly because he believed Jacques had murdered Laura. Are these actors, whose characters were absolutely dead on the show, going to pop up as new characters—or again, will they appear in flashbacks to events of the past? Very much alive on the show: Cooper’s brilliant FBI colleague Albert Rosenfield (Miguel Ferrer), who will return hopefully just as sarcastic, insulting and yet staunchly pacifistic as he was before. Cooper’s hard-of-hearing FBI supervisor, Gordon Cole—played by Lynch himself—is also back. David Duchovny, who played FBI agent Denise Bryson, is also on the cast list. This must mean Cooper still has FBI ties, even if he’s out of the bureau himself? This is assuming the actors will play the same characters as before... because who knows what Lynch will do? If you’ve seen Mulholland Drive or Inland Empire, you know there’s nothing set in stone in his universe. Also, we have no idea how many episodes anyone appears in. There could be 25 seconds with Agents Rosenfield, Cole, and Bryson on an elevator, and that’s it for the whole thing. That said, though, let’s hope Catherine Coulson—the series’ beloved Log Lady, who passed away late last year—gets to steal more than one scene. Naomi Watts—whose big break was starring in Lynch’s Hollywood nightmare Mulholland Drive—will hopefully be playing something juicy. Maybe a relative of the long-dead Teresa Banks, Leland/BOB’s first victim? (The presence of Harry Dean Stanton, who played Banks’ convivial trailer-park landlord in Fire Walk With Me, suggests her storyline will be a factor in the new show.) Amanda Seyfried, who knows about playing a dead girl at the center of a mystery—thanks, Veronica Mars—could be a Twin Peaks resident; maybe there are job opportunities beyond “waitress at the Double R” and “perfume counter at Horne’s Department Store (wink, wink)” for the town’s younger generation of beauties now. Twin Peaks’ soap-within-a-soap is such a cult favorite among fans of the show that you can watch the entire uncut segment, directed by Mark Frost, through the fuzzy magic of YouTube. More, please!